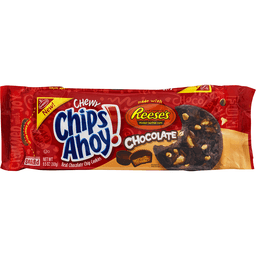 Per 2 Cookies: 140 calories; 3.5 g sat fat (18% DV); 45 mg sodium (2% DV); 9 g sugars. Who says you have to do something amazing to deserve a Milano cookie? 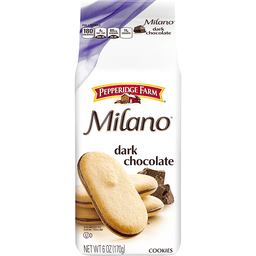 Share your love for Milano cookies at: facebook.com/pepperidgefarmmilano. Tell us what you think of our baking. Call us toll free at: 1-888-737-7374. Baked with no artificial flavors or preservatives (just one more reason why they're so good). Partially produced with genetic engineering. Baked in USA. 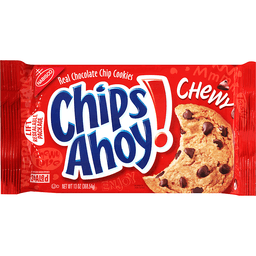 Nabisco Chips Ahoy Chewy Cookies. Real chocolate chip cookies. Lift resealable package. Chewy love. Slit appears when opened. Sealed. Enjoy. Share me! Crammed with real chocolate chips. 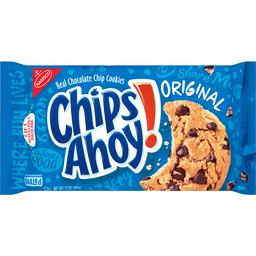 There's a lotta joy in chips ahoy! Tasty. Soft & yummy. Yeah mmmm. Crowd pleaser. 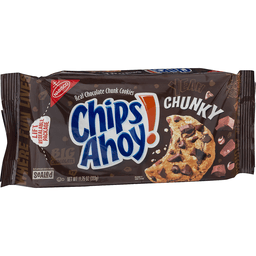 Visit us at: facebook.com/chipsahoy or call weekdays: 1-800-622-4726. ©Mondelez International. Per 1 Cookie: 140 calories; 3 g sat fat (15% DV); 75 mg sodium (3% DV); 10 g sugars. If you're going to have a cookie, have a cookie. 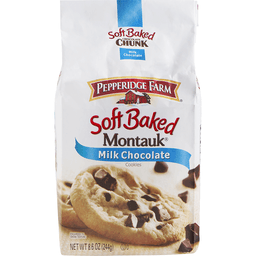 And not just any cookie - we're talking about a Montauk. Filled with chunks of rich and creamy milk chocolate, these cookies are made with real butter, eggs and vanilla flavor - it's the kind of cookie that's more than a treat, it's an experience! Try our other delicious varieties. Partially produced with genetic engineering. Satisfaction guaranteed. For questions or comments, please call 1-888-737-7374. Thank you. Baked in USA. New! 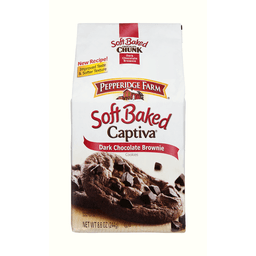 Per 2 Cookies: 140 calories; 4 g sat fat (20% DV); 45 mg sodium (2% DV); 10 g sugars. Irresistible. So why resist? 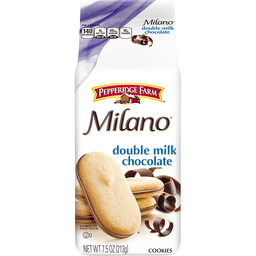 Share your love for Milano Cookies at: facebook.com/pepperidgefarmmilano. Tell us what you think of our baking. Call us toll free at: 1-888-737-7374. 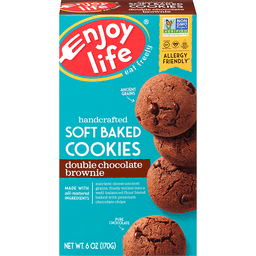 Baked with no artificial flavors or preservatives (just one more reason why they're so good). Partially produced with genetic engineering. Baked in USA. 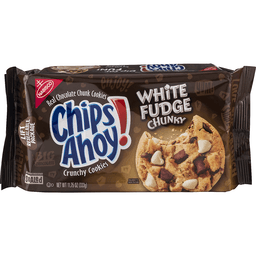 Per Cookie: 80 calories; 1.5 g sat fat (8% DV); 35 mg sodium (1% DV); 5 g sugars. Where fun lives. Big chocolate. Enjoy! Yum! Share'em. Love the crunch. Cool idea! Dip for fun! Try with your favorite ice cream! Try our other varieties! 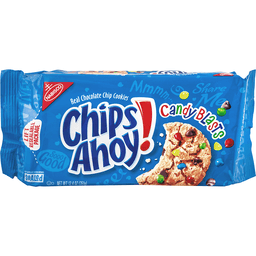 Visit us at: facebook.com/chipsahoy. Or call weekdays: 1-800-622-4726. Made in Mexico. 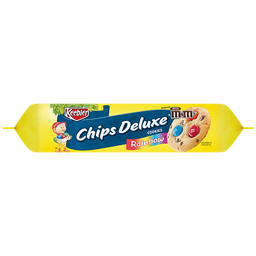 Per Cookie: 80 calories; 1.5 g sat fat (8% DV); 40 mg sodium (2% DV); 6 g sugars. Where fun lives. Big chocolate. Enjoy! Yum. Share'em. Love the crunch. Cool idea! Dip for fun! Try with your favorite ice cream! Try our other varieties! Visit us at: facebook.com/chipsahoy or call weekdays: 1-800-622-4726. 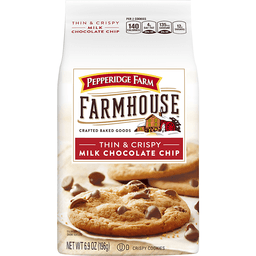 Per 3 Cookies: 180 calories; 4 g sat fat (20% DV); 60 mg sodium (3% DV); 11 g sugars. Can a cookie be good for the soul? We think so. 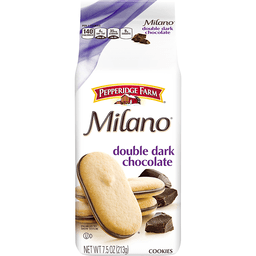 Share your love for Milano cookies at: facebook.com/pepperidgefarmmilano. Tell us what you think of our baking. Call us toll free at: 1-888-737-7374. Baked with no artificial flavors or preservatives (just one more reason why they're so good). Partially produced with genetic engineering. Baked in USA. Made with milk chocolate Reese's Peanut Butter Cups. 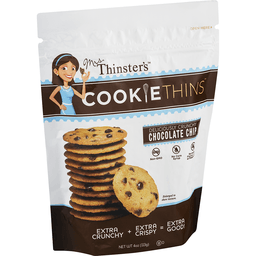 Per 2 Cookies: 140 calories; 3.5 g sat fat (18% DV); 90 mg sodium (4% DV); 10 g sugars. Sealed: Slit appears when opened. Visit us at: facebook.com/chipsahoy or call weekdays: 1-800-622-4726. Cookies for everyone! Try all of our tasty varieties. Made in Canada. Chocolate chunk crispy cookies. 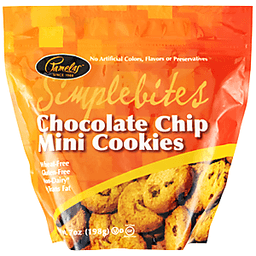 Per 1 Cookie: 130 calories; 3.5 g sat fat (18% DV); 75 mg sodium (3% DV); 9 g sugars. If you're going to have a cookie, have a cookie. 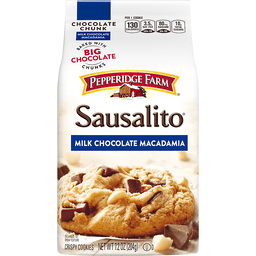 And not just any cookie - we're talking about a Sausalito. Filled with chunks of rich milk chocolate and crunchy macadamia nuts, these cookies are made with real butter, eggs and vanilla flavor - it's the kind of cookie that's more than a treat, it's an experience! Try our other delicious varieties. Partially produced with genetic engineering. Satisfaction guaranteed. For questions or comments, please call 1-888-737-7374. Thank you. Baked in USA. Chocolate chunk crispy cookies. 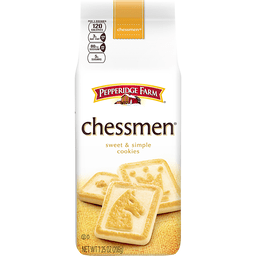 Per 1 Cookie: 140 calories; 3.5 g sat fat (18% DV); 70 mg sodium (3% DV); 11 g sugars. If you're going to have a cookie, have a cookie. 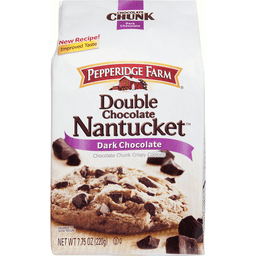 And not just any cookie - we're talking about a Double Chocolate Nantucket. Filled with extra chunks of rich dark chocolate, these cookies are made with real butter, eggs and vanilla flavor - it's the kind of cookie that's more than a treat, it's an experience! Try our other delicious varieties. Partially produced with genetic engineering. Satisfaction guaranteed. For questions or comments, please call 1-888-737-7374. Thank you. Baked in USA. Made with real cocoa! Uncommonly made. Uncommonly good. Kellogg's family reward. We don't fudge on our fudge. When fudge is rich and creamy and made with only 100% real cocoa, no matter where it goes, it's wonderfully delicious. So that's exactly what we elves use. Then we add a little of our magic to bake up oh-so-many delightful and different kinds of fudge cookie. We love our fudge. Oh, how it can please. - Ernie Keebler. Kellogg's Family Reward: Collect points. Earn rewards. Two easy ways to collect points! Go to KFR.com to learn more. Come see uncommonly good things at www.keebler.com. 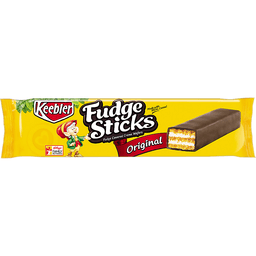 Follow us on - Facebook FudgeShoppe. how2recycle.info. 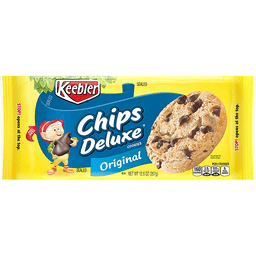 Visit: keebler.com. Call: 1-877-453-5837. Baked proudly in the USA. Tate's Bake Shop Double Chocolate Chip Cookies. Southampton, NY. Uniquely crispy. Deeply delicious. Rich crispy scrumptious. Signature rich crispy cookies combining the best of ingredients and a passion for baking. A little bake shop in every bite. The bake shop way. 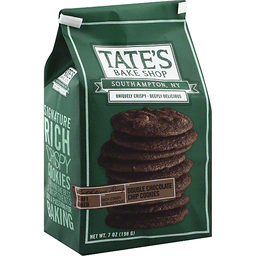 What makes Tate's Bake Shop cookies so deeply delicious It's something we call "The Bake Shop Way". It started when 11-year-old Kathleen King began baking cookies to sell at her parent's farmstand. Her love of baking and dedication to quality made her crisp, buttery cookies legendary in Southampton, and were the inspiration for what eventually became Tate's Bake Shop. While our bake shop is still a local favorite, our cookies have won a loyal following from coast to coast, with Kathleen's intuition, passion and principles guiding everything we do. So enjoy one of our deeply delicious cookies and experience "The Bake Shop Way". Find more craft-baked goodness at tatesbakeshop.com. 631-780-6511. www.tatesbakeshop.com. Southampton, NY. Uniquely crispy. Deeply delicious. Gluten free. Founder approved. Created by: Kathleen King. Craft baked. Texture: Crispy thin scrumptious. A little bake shop in every bite. 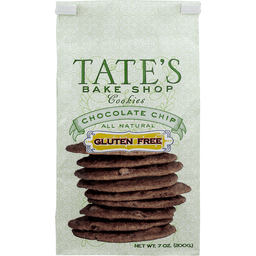 The Bake Shop Way: What makes Tate's Bake Shop Cookies so deeply delicious? It's something we call the bake shop way. It started when 11-year-old Kathleen King began baking cookies to sell at her parent's farmstand. Her love of baking and dedication to quality made her crisp, buttery cookies legendary in Southampton, and were the inspiration for what eventually became Tate's Bake Shop. While our bake shop is still local favorite, our cookies have won a loyal following from coast to coast, with Kathleen's intuition, passion and principles guiding everything we do. So enjoy one of our deeply delicious cookies and experience the bake shop way. Find more craft-baked goodness at TatesBakeShop.com. Facebook. Twitter. Pinterest. Instagram. Signature thin crispy cookies combining the best of ingredients and a passion for baking. Celiac Sprue Association. www.tatesbakeshop.com. Made in the USA. 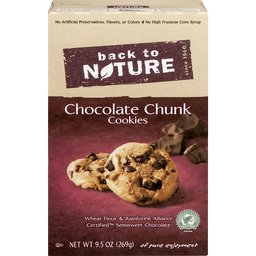 Back to Nature Cookies Chocolate Chunk. Since 1960. Wheat Flour & Semisweet Chocolate Chunks of Pure Enjoyment. Net Wt. 9.5 oz (269 g). Simply delicious. Simply good. Since 1960, back to nature has been creating delicious and flavorful recipes inspired by nature. We carefully select our ingredients to create great-tasting products that you can enjoy all day long. Our mission is to provide everyday foods that are simply delicious, simply good. Here's the great stuff about Chocolate Chunk Cookies: Chocolate Chunk Cookies will remind you of your first oven-baked cookie.... So smile knowing that goodness makes a difference. 100% Recycled Paperboard®. Minimum 55% post-consumer content. Our Commitment to sustainability.... This carton is made from 100% recycled paperboard. Our carton manufacturing facility reuses and recycles more than 95% of the solid wastes from the process. And we print our cartons with vegetable inks from renewable sources like soy, flax and tree nuts. Try some of our other products. Cookies. Granola. Crackers. Nuts. Look for our other organic, whole grain and gluten free products. Non GMO Project Verified. nongmoproject.org. www.backtonaturefoods.com. © 2016 Back to Nature Foods Co., LLC. Resealable package. Crammed with real chocolate chips & candy coated fudge pieces! Made in Mexico. Chocolate chunk crispy cookies. Per 1 Cookie: 130 calories; 3 g sat fat (15% DV); 70 mg sodium (3% DV); 8 g sugars. If you're going to have a cookie, have a cookie. 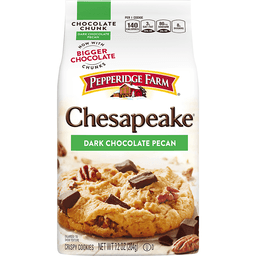 And not just any cookie - we're talking about a Chesapeake. Filled with chunks of rich dark chocolate and crunchy pecans, these cookies are made with real butter, eggs and vanilla flavor - it's the kind of cookie that's more than a treat, it's an experience! Try our other delicious varieties. Partially produced with genetic engineering. Satisfaction guaranteed. For questions or comments, please call 1-888-737-7374. Thank you. Baked in USA. Deliciously crunchy. Real butter. Real sugar. Real good. No artificial flavors, colors, or preservatives. Mrs. Thinster's new look! No corn syrup. Peanut free. No hydrogenated oil. Non GMO. Real dark chocolate. Bite-size cookies. Outsize flavor. Hey there cookie lover, snack hacker, flavor seeker. You're about to experience a cookie snacking phenomenon. These crispy, crunchy cookies pack a delicious punch that boosts your mood with bursts of flavor. Plus, they're made with better-for-you ingredients like real butter and real sugar, and oven-baked just the way you like them. So pop open a bag of our thin, buttery cookies and celebrate a sweet new way of snacking. 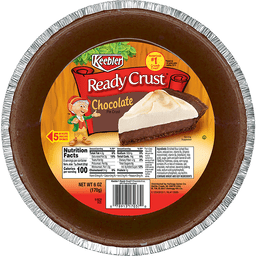 Save your crumbs for an ice cream topper! thinsters.com. (hashtag)thinsters. Since 1975. Semi-sweet Ambrosia chocolate chips. It takes heart to make a great cookie. Originally, Wally Amos baked delicious cookies in his home to share with his friends and family. In 1975, he was inspired by a passed-down family recipe and perfected the ultimate chocolate chip cookie. With the commitment to use only the best ingredients, he then started his own company. Wally's homemade-tasting cookies with semi-sweet chocolate chips and flavorful nuts were so special they became famous just by word of mouth. Today, Famous Amos cookies still meet these high expectations and are enjoyed by all true cookie lovers. Enjoy the special recipe and homemade taste that made Amos famous! - Wally Amos. 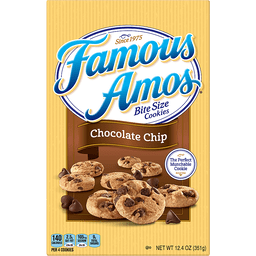 Treat yourself to a cookie break with Famous Amos cookies. Bite Size, crunchy and packed with rich chocolate, they are perfect for dunking in a glass of milk or all by themselves. Questions or comments? Visit: famousamos.com. Call: 1-877-453-5837. Provide production code on package. Sustainable Forestry Initiative certified sourcing. www.sfiprogram.org. how2recycle.info. Since 1960. 6.4 oz (181 g) of pure enjoyment. For more on sustainability see the side panel. 100% recycled paperboard. Minimum 55% post-consumer content. Simply delicious. Simply good. Since 1960, Back to Nature has been creating delicious and flavorful recipes inspired by nature. We carefully select our ingredients to create great-tasting products that you can enjoy all day long. Our mission is to provide everyday foods that are simply delicious, simply good. 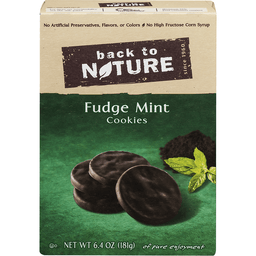 Here's the Great Stuff About Fudge Mint Cookies: A crisp, chocolate flavored cookie baked with a hint of peppermint oil and covered with smooth, rich fudge. Sweetened with cane sugar and dutched cocoa. Try some of our other products. Look for our other organic, whole grain and gluten free products. Our Commitment to Sustainability: This carton is made from 100% recycled paperboard. Our carton manufacturing facility reuses and recycles more than 95% of the solid wastes from the process. And we print our cartons with vegetable inks from renewable sources like soy, flax and tree nuts. And nature. Back to Nature is proud to support the Nature Conservancy, a leading, global conservation organization that protects ecologically important lands and waters for nature and people. We are committed to this cause because we believe a healthier planet leads to healthier and happier people. The Nature Conservancy: Protecting nature. Preserving life. nature.org. To learn more about Back to Nature: visit us and send us your feedback at www.backtonaturefoods.com or www.facebook.com/backtonature. This package is sold by weight, not by volume. Some settling of contents may have occurred during shipping and handling. New look. Gluten-free & non-dairy (Chips may contain traces of milk protein due to manufacturing equipment). Certified gluten-free by GFCO. Wheat-free. Non-dairy (Chips may contain traces of milk protein due to manufacturing equipment). No artificial additives. No hydrogenated oils or trans fats. Made with real chocolate & vanilla. Low cholesterol. Exceptionally good cookies since 1988. Check our website for great recipes and how-to videos at PamelasProducts.com. Learn more about Pamela's premium, gluten-free products at PamelasProducts.com. Pamela's Products is proud to support national and regional non-profit Celiac Disease, Gluten Intolerance and Autism Support Organizations. Questions or concerns, please contact us by phone (707) 462-6605. www.pamelasproducts.com. Product of the USA. Gluten-free & non-dairy (Chunks may contain traces of milk protein due to manufacturing equipment). Non GMO Project verified. nongmoproject.org. Certified gluten-free. 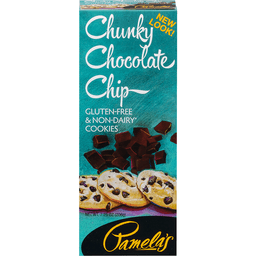 Pamela's Products cookies are formulated and produced to be wheat-free and gluten-free, and manufactured in a gluten-free certified facility. Questions or concerns, please contact us by phone (707) 462-6605. Pamela's Products is proud to support national and regional non-profit celiac disease, gluten intolerance and autism support organizations. Exceptionally good cookies since 1988. www.pamelasproducts.com. Printed with soy ink. 100% recycled paperboard. Product of the USA. Made with real chocolate chunks! Kellogg's Family Rewards. Sealed. What could be better than chocolate chips? More chocolate chips! We elves know that's the secret to Chips Deluxe: be generous with real chocolate chips. Take care to stir lots of them into our special batter so you end up with a scrumptiously thick, rich chocolate chip cookie. Chips, chips and more chips. How wonderfully delicious! - Ernie Keebler. Kellogg's Family Rewards: Collect points. Earn rewards. Two easy ways to collect points! Go to KFR.com to learn more. Come see uncommonly good things at www.keebler.com. Follow us on Facebook. how2recycle.info. Produced with genetic engineering. Questions or comments? 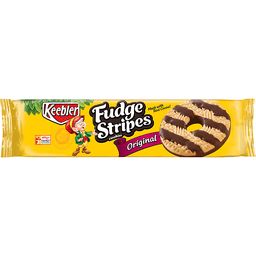 Visit: keebler.com. Call 1-877-453-5837. Provide production code on package. Uncommonly made. Uncommonly good. Made with organic figs. Wheat-free. Dairy-free. Contains gluten. All profits to charity. 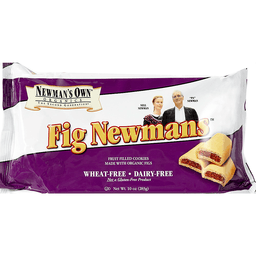 Newman's Own Foundation continues Paul Newman's commitment to donate all royalties and after tax profits from this product for charitable purposes. Paul Newman and Newman's Own Foundation have given over $400 million to thousands of charities since 1982. Learn more at newmansownfoundation.org. No artificial flavors, colors or preservatives. www.newmansownorganics.com. Certified organic by Oregon Tilth. Cookies made in the USA. Made with real chocolate! Kellogg's Family Rewards. New! Resealable packaging. Sealed. What could be better than chocolate chip? More chocolate chips! 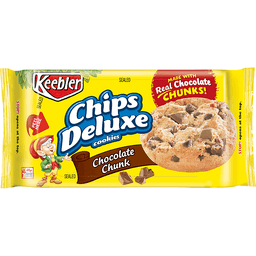 We elves know that's the secret to Chips Deluxe: be generous with real chocolate chips. Take care to stir lots of them into our special batter so you end up with a scrumptiously thick, rich chocolate chip cookie. Chips, chips and more chips. How wonderfully delicious! - Ernie Keebler. Kellogg's Family Reward: Collect points. Earn rewards. Two easy ways to collect points! Go to KFR.com to learn more. Come see uncommonly good things at www.keebler.com. Follow us on Facebook. how2recycle.info. Questions or comments? 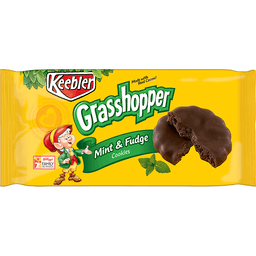 Visit: keebler.com. Call: 1-877-453-5837. Provide production code on package. Uncommonly made. Uncommonly good. Baked proudly in the USA.